The language has changed but the conversation is the same today as it was 50 years ago, 100 yeas ago or a 1,000 years ago when we lived in a cave. All people on the planet are connected. We all share the love of family and the comfort of community. No matter what continent or island, no matter today, tomorrow or in some remote prehistoric past we all have the same basic needs – food, shelter, clothing. There is evidence of nomadic peoples traversing the canyons and mesas near Tsankawi 10,000 years ago. Following game animals, traveling with the seasons they were a hunter gatherer people on the move. About 1100 A. D. permanent settlement of the area began. This was a time of great change and migration of native people in the southwest, particularly those from the Four Corners area. A severe and prolonged drought, dwindling resources and societal disruption are factors that contributed to families and clans leaving ancestral homes at Chaco, Mesa Verde and Canyon de Chelly. The Pajarito Plateau provided a sanctuary with the resources to procure food, shelter and materials for clothing, blankets, baskets and other necessities. Small settlements grew into larger communities during the Pueblo III Era (1150 to 1350). Although the climate is dry (rainfall of 15″ a year) the inhabitants grew corn, beans and squash on the valley floor. 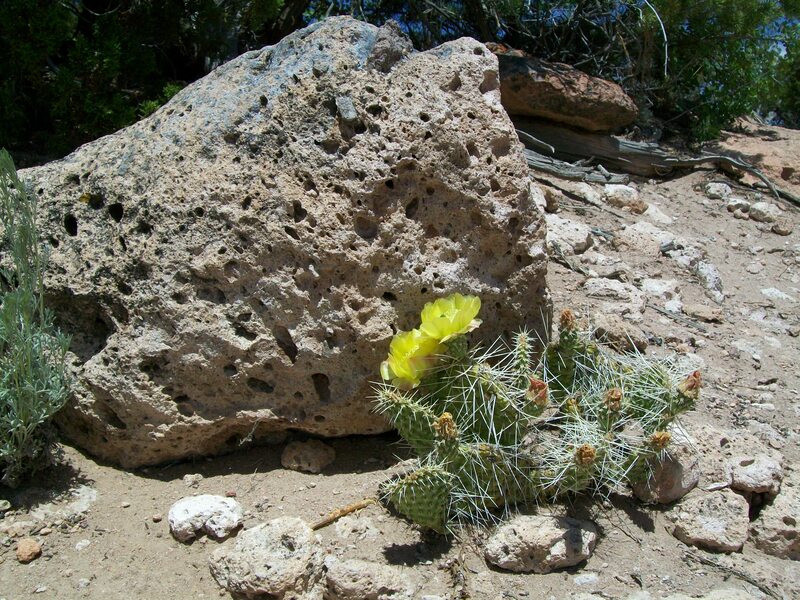 Native plants such as mountain mahogany, rabbit brush, salt bush, yucca, juniper and pinon were used for medicines, dyes and clothing. Clay was formed into pottery for cooking, storage and water vessels. 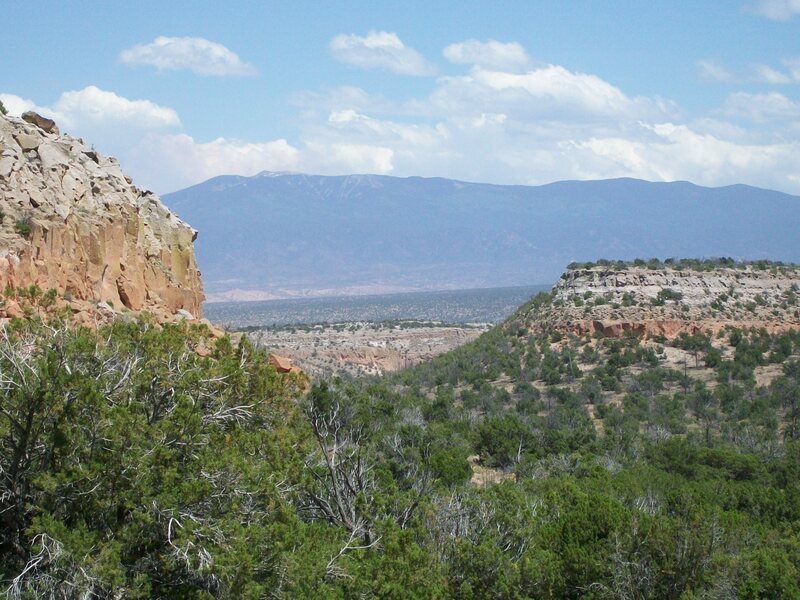 In the nearby Jemez mountains obsidian and flint for arrow heads and scrapers could be found as well as volcanic basalt for matates, grinders and other tools. 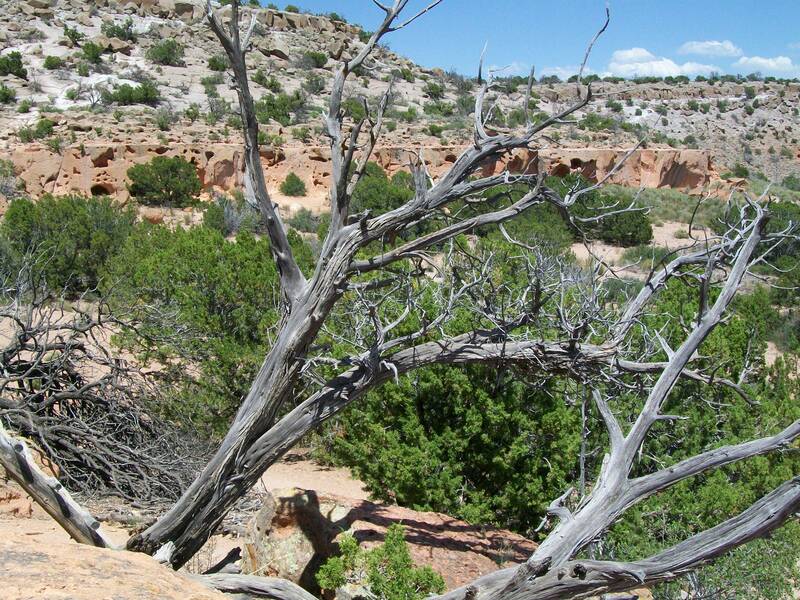 Squirrel, rabbit, turkey, deer, elk, mountain lion and bear were hunted along the mesas and in the mountains. Shelters built along the south facing cliff walls had the advantage of warmth from a winter sun. 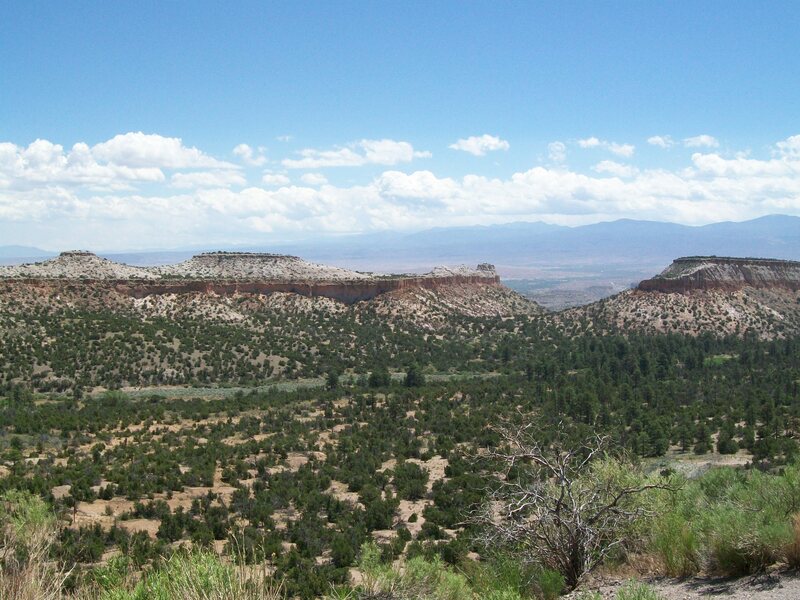 The mesas of the Pajarito Plateau are almost entirely formed of tuff and breccia, which is the solidified ash and debris of a massive volcanic eruption. The Valle Grande the worlds largest caldera is to the west of Tsankawi in the Jemez mountains which were also formed by the same volcano. The soft tuff throughout the area is pocked with cavate, small hollows that are easily enlarged by scraping with simple tools and were made into dwellings at the base of cliffs. By stacking talus stones along the front, the cave could be extended outwards. Tree branches covered with thick layers of dirt formed a water tight roof and mud plaster smoothed interior walls and sealed chinks. 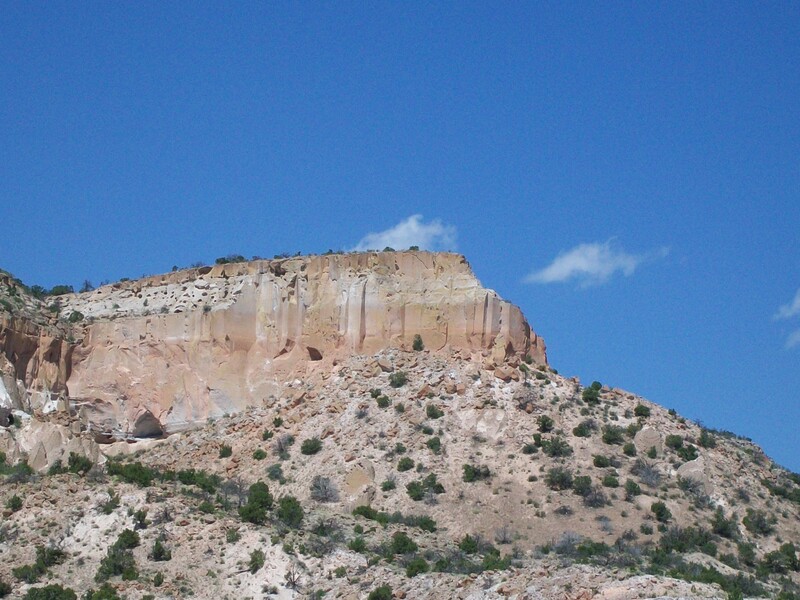 As the Tsankawi community grew during the Pueblo IV Era (1350 to 1600) a large Pueblo style village of 1 to 3 stories was built on top of the mesa. Hiking the time worn trails of this undeveloped archeological site is a great experience. I’ve spent countless days and afternoons discovering and exploring here in the lands of the ancestral Pueblo people. Seldom do I encounter others in this isolated area, especially in winter when I can sit with my back to a southern wall and soak in the sun, watching hawks gliding thermals and listen to a breeze in the junipers. During the Pueblo IV Era the people were not at all isolated. There were many other settlements and villages in the area like Tyuonyi (Que-weh-nee) in Frijoles Canyon and Puye (where the rabbits meet). Those places now are abandoned. 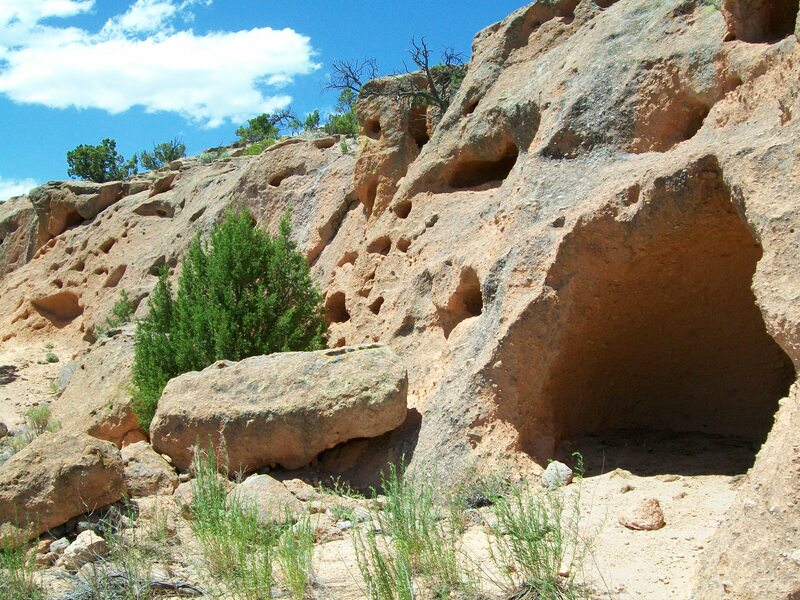 After living in the canyons and mesas of the Pajarito Plateau for 500 years another drought occurred, the large population caused depletion of resources and the people once again migrated (about 1600 A.D.) and abandoned the old villages. It’s all about where you can get your food, shelter and clothing. Is your village consuming more resources than can be replenished? Will climate change affect the dynamics of your community? Where will your tribe migrate to? Tsankawi is a small portion of Bandelier National Monument in northern New Mexico. 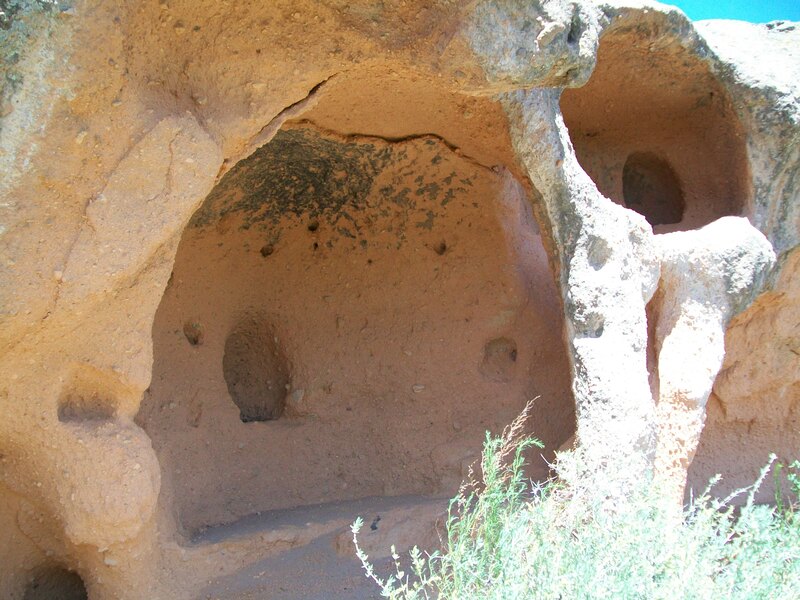 If curious you can view pictures of the many petroglyphs and cliff dwellings and see where we lived in a cave. This entry was posted in earth, environment, history, Nature and tagged Earth, environment, history, Los Alamos, Society, volcano. Bookmark the permalink. Beautiful images and words. 🙂 This is my singlemost favorite place in the entire world, Bandelier National Monument. Oh I miss living in New Mexico! That is really good. I like the conversation at the start because that is exactly how I feel about all the people in all the civilisations that have passed before. They are so far away in time, but they are so close because – really – they are the same as us. Their needs are the same, their aspirations the same. Food, shelter, clothing – that’s all they wanted and that’s all we need. Alen thank you. Back at the Lower Farm in New Mexico the house does not have indoor plumbing – someday it will. In the mean time I tell myself that people have already lived here for 150 yrs – am I so different that I can’t survive as they did. Thank you for another insightful post. I find it ironic that our society has forgotten (and needs to relearn) some of the basics that came naturally to humans thousands of years ago. Things like positioning and building your home in order to get maximum use of sunlight. Having your source of food close to home. Thank you for this trip to the past. It is a great reminder that what really matters is “food, shelter and clothing”.